There hasn’t been much good news for NKE shareholders subsequent to the 12/7/15 announcement that it had allegedly signed a life-time sponsorship deal with Lebron James for $1 billion. Indeed, they say nobody rings a bell at the top, but that is precisely what both parties appear to have done, with nothing but downside for the shares since. 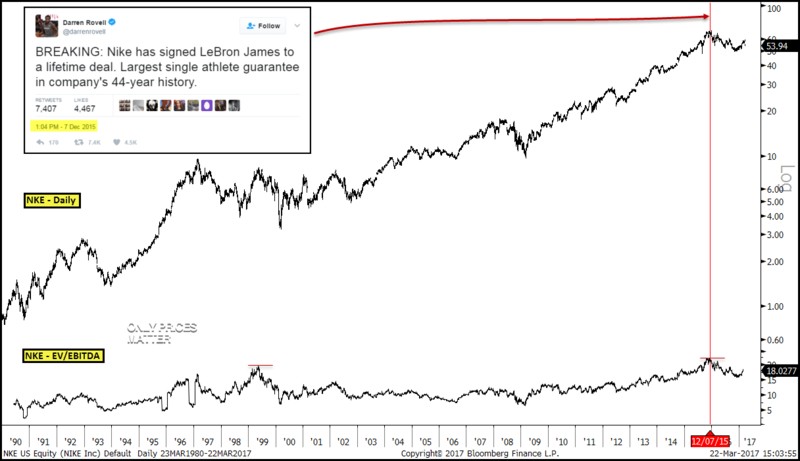 Let’s hope the deal wasn’t all stock for LBJ; considering not only were the shares trading at an all-time high, but their valuation on an EV/EBITDA basis was well in excess of anything they had ever printed in history as well, NKE shrewdly consummated the deal with what was some fairly over-priced currency at the time.